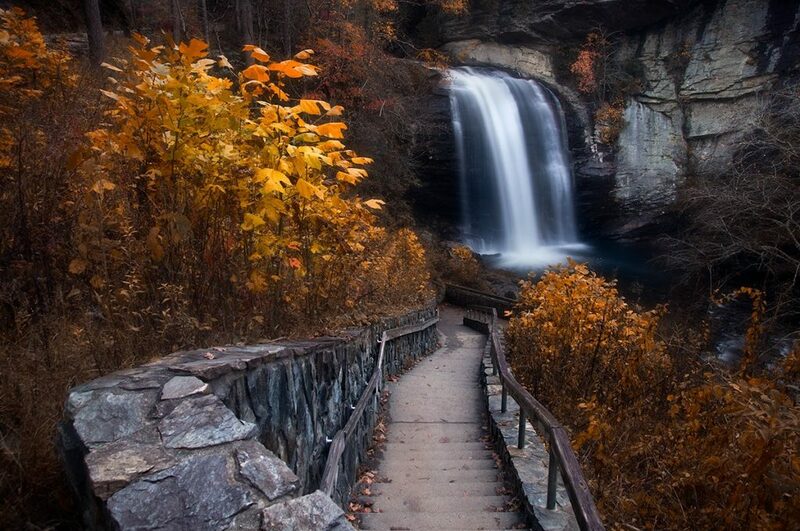 Western North Carolina has become well known as a destination for fall color, and for good reason. The mountains of the NC Blue Ridge offer spectacular views of Autumn’s patchwork quilt over the forest canopy, and because of the dramatic changes in elevation, the area boasts one of the longest leaf seasons in the country. It typically begins in late September along the highest elevations around Mt. Mitchell, and lasts through early November as color rolls down to the foothills. This means you have the chance to see beautiful color no matter what time of the season you visit. 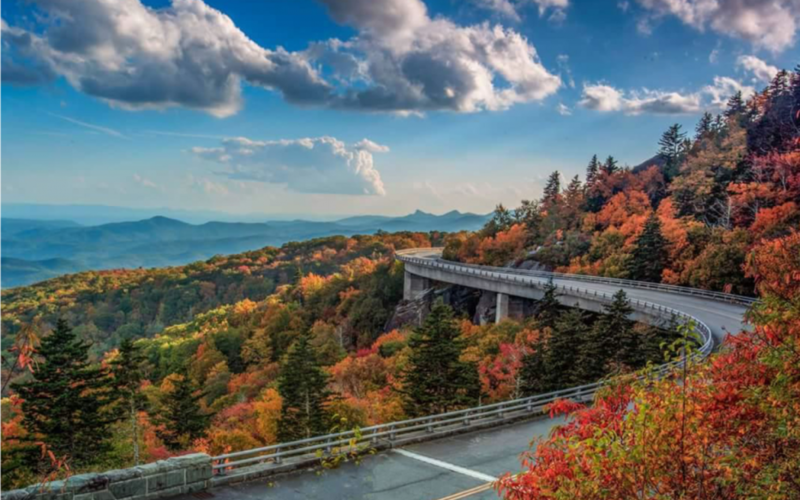 In the early season (late September – early October) you typically need to go above 4,000 feet in elevation to find fall color, and the best way to do that is to drive along the Blue Ridge Parkway. Areas that tend to transition first include Mt. Mitchell followed by the Great Craggy Mountains where Craggy Gardens and the Craggy Pinnacle Hike can be accessed. Around the garden, don’t just look for trees in transition. You’ll find that wildflowers add their own flair to the season. Other areas along the Parkway where fall foliage comes early include Graveyard Fields, a popular hiking spot with easy trails and multiple waterfalls, and Black Balsam Knob, which offers near-360 views of the surrounding mountains. October is when things begin to accelerate as cool nights and warm days jump start the peak season, making it the best time to watch the mountains pop with bright yellows, rusty orange, and deep red hues. Typically around the second week of the month is when Grandfather Mountain with an elevation of 5,945 feet, typically begins to see color emerge. Oaks, red maples, black cherries, and birches are all typically the first to turn. Blueberry bushes at the higher elevations will turn a brilliant red. In mid-October, color begins to progress into elevations around 3,000 – 4,000 feet. During this time you should visit the Cradle of Forestry (elevation 3,260 feet), which will showcase a number of trees in transition. It’s located in the heart of the Pisgah National Forest, and is a perfect jumping off point for other outdoor adventures like nearby Looking Glass Falls. 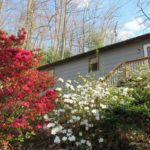 Around the Blue Ridge you’ll find fall foliage appearing around mountain towns like Little Switzerland and Banner Elk. This is a great time to check out Linville Falls, one of the more popular hiking spots located in Burke County. The combination of a towering waterfall surrounded by fall color makes this one of the most sought after spots for color hunters. Nearby you’ll find the Orchard at Altapass, which offers beautiful views, hiking trails, live music, and of course fresh apples. 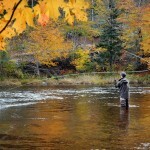 Fly fishing tours are available with Southern Appalachian Anglers. In late October, fall color will encompass areas below 3,000 feet in elevation. 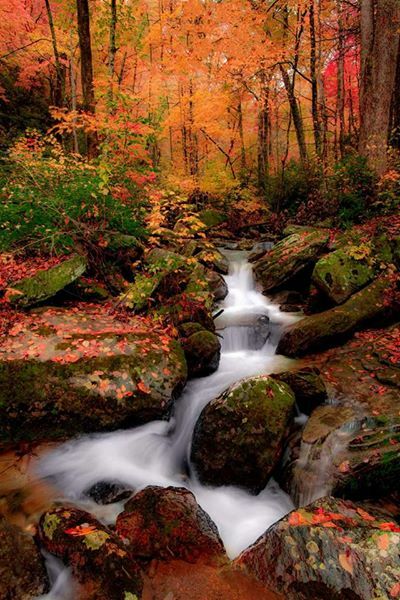 You’ll find beautiful foliage throughout many of the mountain towns around the NC Blue Ridge. In Asheville, check out the Biltmore, the UNCA Botanical Gardens, or the NC Arboretum. These areas are all stunning during this time of year, and showcase a mix of native and exotic species. 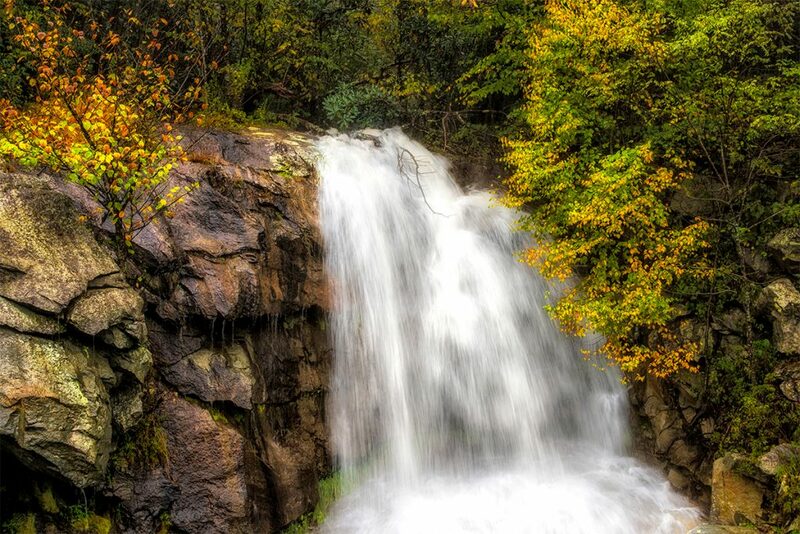 In Transylvania County, you’ll find access to hundreds of waterfall adventures just outside of Brevard. Nearby on the border of this county and Henderson County you’ll find Dupont State Forest, which offers over 10,000 acres of outdoor exploration. Multiple trails and waterfalls make this a popular spot year round, but especially in the fall when the colors are so vivid. Check out nearby Merry Falls, which is very close to DuPont. If you’re looking for family-friendly activities, then Henderson County also offers harvest adventures like apple-picking and corn mazes that are always popular this time of year. A favorite spot for many leaf lookers is the town of Hot Springs, located along the banks of the French Broad River. From here you can start your day with a hike along the Appalachian Trail and end it with a soothing soak in their mineral baths. Other great town to explore include Spruce Pine and Burnsville where you’ll find some beautiful spots to hike, trout fish, shop for handmade crafts by local artisans. This photo and the header image of the Linn Cove Viaduct courtesy of Michelle Schwartz. Once November rolls around, you’ll find fall color creeping below 2,000 feet in elevation. This is the time to visit areas like Chimney Rock Park in Rutherford County, which has stunning views of the surrounding mountains and nearby Lake Lure. There’s also Lake James State Park in Burke County, which is another gorgeous and peaceful area to enjoy the leaf season. As the fall season winds down in the higher elevations, the foothills begin to peak. Go to Old Fort to hike the Catawba Falls trail, which is a fairly easy in-and-out trail that takes you to the base of a nice waterfall. You should also visit the towns of Columbus and Tryon, where you can explore a 268-acre forest cove with a quarter-mile hike to a dramatic 90-foot waterfall called Pearson’s Falls. Enjoy the season, and happy leaf peeping!